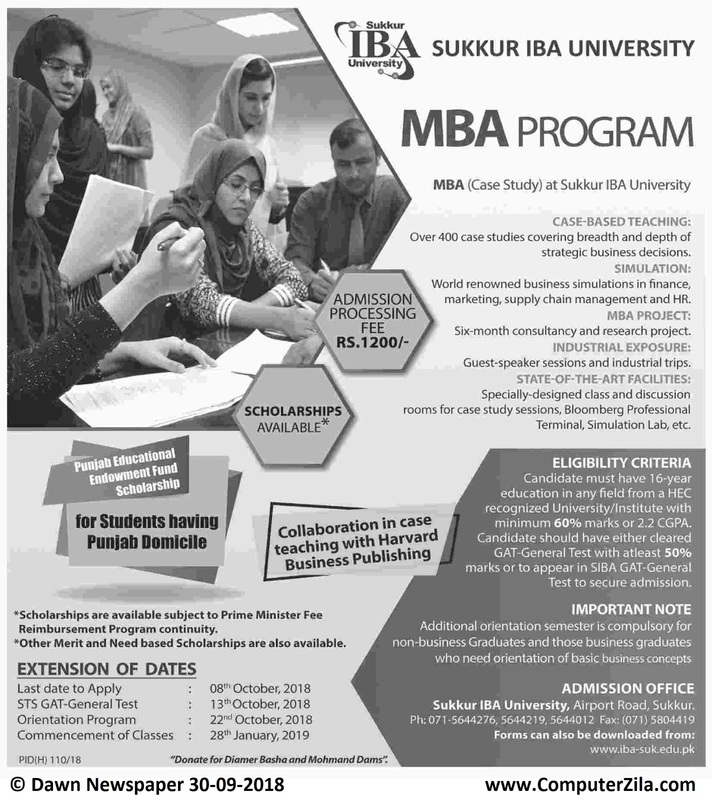 Admissions Open at Sukkur IBA University's Main Campus, Sukkur for the batch Spring 2019. SUKIBA offers admissions in different fields of study for Master Programs. Scholarships available under Punjab Educational Endowment fund for students having Punjab domicile, scholarships are also available under Prime Minister fee reimbursement program (if continued), other need and merit based scholarships are also available. University DescriptionThe Sukkur IBA University (previously Sukkur Institute of Business Administration or Sukkur IBA) is a higher education institute in Sukkur, Pakistan. The university is a public sector degree-awarding institute chartered by the Government of Sindh and recognized by the Higher Education Commission. In 1994, the school was established as Sukkur Institute of Business Administration. It was located initially in hired rooms of Public School Sukkur building in Sukkur. At first, Sukkur IBA was affiliated to Institute of Business Administration, Karachi; with founding Director Professor Dr. Syed Anwar Ali Shah (Present Pro-Vice Chancellor University of Sindh) the institute received its full charter from the Government of Sindh in 2006, creating an opportunity for the Sindhi youth. The institute is ranked 3rd among the five independent business schools of Pakistan included in the Higher Education Commission Pakistan Business School Ranking-2013.